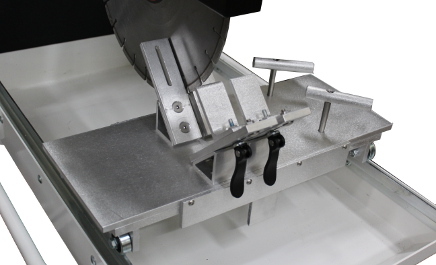 To compliment our cracking performance machines, we carry sawing equipment to meet your sample preparation needs. We are an approved reseller of Diamond Products and MK Diamond equipment. 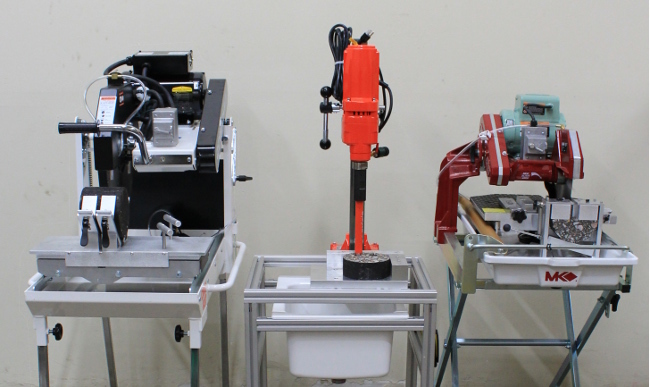 Our lineup of saws includes a 16" brick saw, a 10" tile saw, and a core drill mounted to a custom stand. Additional fixtures and alignment blocks are added to each saw to allow quick and accurate cutting. Our goal is to set a new standard for sample preparation! Read more below, or download the brochure. Check out our YouTube page for videos of the saws as they become available! 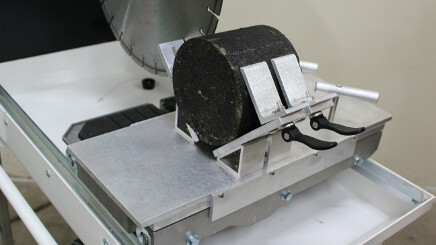 We offer a 16" brick saw from Diamond Products (based on model CC500M) for cutting specimen disks from a gyro specimen or field core. A minimum 16" saw blade is required to cut 6" disks, and offers a significant savings over a 20" saw. The saw can operate on 230VAC or 120VAC, and we offer an optional plug adaptor to choose which power option works best for you. We have developed an ALL NEW custom fixture that takes the guesswork out of cutting specimen disks. Once the specimen is loaded, there is no clamping and re-clamping. Simply slide the table to the pre-configured offsets (50mm and 62mm standard thicknesses; others may be available upon request), and lock the fixture in place with the two included dowel handles. The included cam handle brackets quickly secure specimens in the fixture between 4" and 6" in diameter. The fixture table can can be configured as its own stand-alone table (leaving the standard table for other cutting purposes), or mounted on the standard saw table (as shown below). The stand-alone table works on both Diamond Products and MK Diamond 16" brick saws. We offer a 10" tile saw from MK Diamond. The tile saw is our most versatile saw! We start with the professional series tile saw (model MK-101 Pro), which includes 0.050" thick blade - the thinnest 10" blade on the market. This blade meets notch cut width requirements for both DCT and SCB specimens. We add a custom spring clamp fixture to the back of the saw table. The spring fixture allows quick loading and secure holding of the specimen to make the notch cut in both DCT and SCB specimens without adjusting the saw blade. Simply change out the spacer blocks to switch between specimen types and notch depths. An optional set of spacer blocks can be added for making the three different notch cuts for the Louisiana SCB (ASTM D8044) method. In addition to the notch cuts, the tile saw is used to make the half cut for SCB specimens, and the flat cut for DCT specimens. We provide a precision machined alignment block that is used to quickly check saw alignment for making all these cuts. We offer a Diamond Products core drill (model M1AA-15) and 1" diameter core bit for drilling load pin holes in DCT specimens (other bit sizes and configurations available upon request). The drill is mounted on a custom built cart, which includes a specimen alignment plate and spacer block. The spacer block is used to quickly offset the specimen to the correct spacing for drilling the second hole. This method is recommended over flipping the specimen to ensure the holes are parallel. The cart also includes a catch basin, and GFCI power strip for powering the drill and other equipment in the vicinity of water.